Select Snap Collar Large 1" 16" to 22" XL 1"W 18" to 26"
Your dog will love wearing this handmade dog collar. 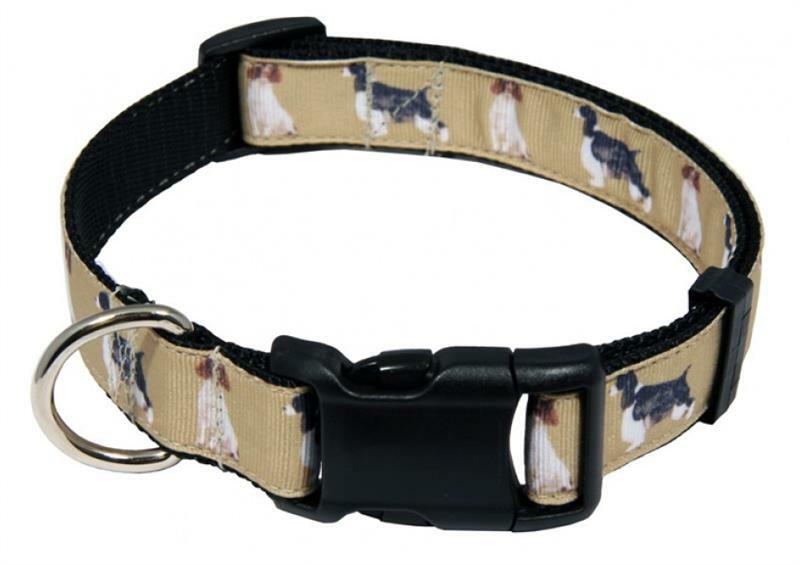 Crafted with sumptuous grosgrain ribbon atop heavy duty nylon webbing, this collar is soft and durable. The stitching is carefully monitored for quality and only B69 heavyweight bonded nylon thread for strength. Box stitching is used instead of triple stitching for an even stronger bond that will hold up to years of abuse. The grosgrain ribbon is made of soft polyester and the pattern is heat sublimated into the fabric for durability. The buckle, either high quality YKK plastic or aluminum, comes with some of the highest rated tensile strengths in the industry. All of this adds up to a quality collar that you can trust to last longer. There are no standard sizes for dog collars. Please be sure to measure your dogs neck for correct size. Measure around your dog's neck (with string or tape measure) snugly where you want the collar to lay.